A quickie for you marker drawers that like the toned paper. 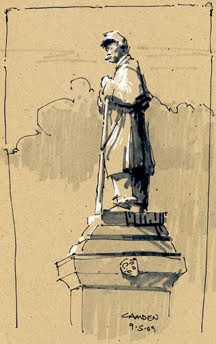 The brilliance of the sun on this statue made it an easy draw... which was good because I only had a few minutes before I was supposed to be at the Smiling Cow. Camden was hopping because it was the weekend of the windjammers. The harbor was full of those tall masted sailing ships which brought a sense of what the area must have looked like when wind and water powered the world....about the time of this Union soldier. It must be the nature of islands that there are constantly new surprises just around the corner. Driving along the pavement came to an end but the road continued onto the beach....when the tide was out. I actually don't know if this was Rustico, South Rustico or North Rustico as I couldn't figure out the distinctions......no matter. I parked on the beach. 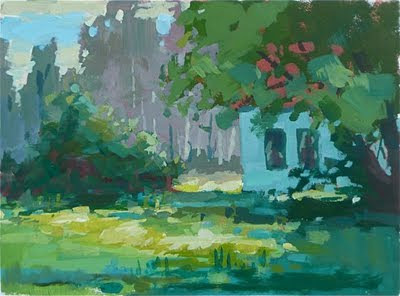 Diana Shyne, a fine artist, was the impetus to get us to Anne of Green Gables land. She is a long time friend and we have painted together frequently and studied under some of the same people. If you get a chance to take one of her workshops, do so. Heading up the Maine coast to Prince Edward Island, and again on the way back, we stayed in this cabin that has been in the family of a friend since 1946. A peaceful lakeside place on twenty acres just a few miles from the coast. No shower. Had to go swimming to clean up. Ahhhhh. You marker fans can pick out the three values pretty easily here. 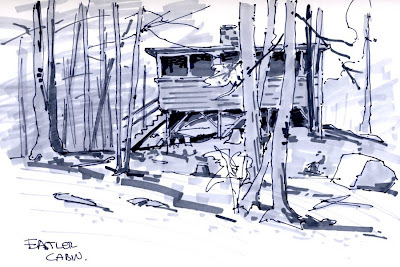 Imagine how I had to subdue the dark forested background in order for the cabin to stand out. It's easier if you follow the first 'rule' and quickly separate the dark from the light before going on to darker values. The same for painting.....use middle values to make a statement about the light and then, like a sculptor, carve out the painting with the darker and lighter tones. At first it was the color of the house peeking through the trees. Then I noticed the light patterns surrounding it. I finally became sold when I noticed the grayed magenta of the background trees. I tried to make the acrylic look more like oil by painting thicker and softening some edges. 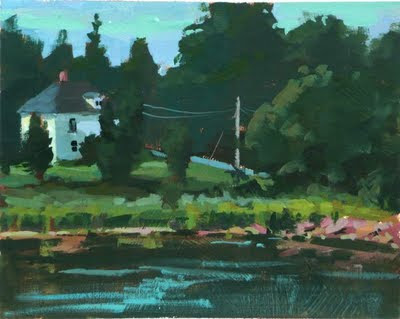 While on PEI we met Richard Vickerson, an accomplished artist in the Andrew Wyeth vein. We first ran into his works just after visiting the Wyeth museum in Rockland, ME, because they were in a gallery across the street. The online pictures of his work don't do him justice. While his style is about as far from my own as you can get, I found his strong abstract patterns and delicate use of color and value mesmerizing....and he's self taught. In the old town of Victoria, PEI, were these two old barns right on the main street. I liked the color contrast going on between the yellow orange of the wood pile and the blue shadowed barns. It also helped that the local chocolate factory/espresso machine was across the street. 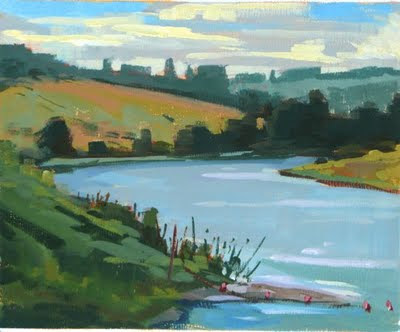 Only one day was rainy and overcast, hence the subdued values and color in this piece. 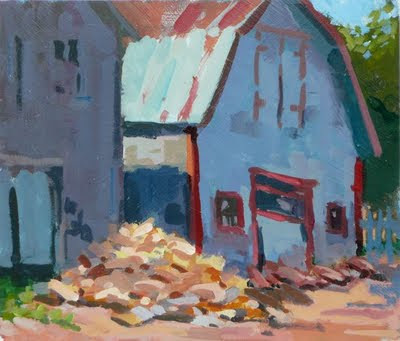 The challenge for me here was how to balance and connect both the farmhouse and the rocks, either of which could have been the focus. I intended to make the house the spot of main interest and use the rocks as a balance, connected by the little slice of road and the power pole. My eye travels around the piece fairly easily, but does it work for you? By the way, I reloaded the two previous paintings to better represent their value and color. Prince Edward Island was a surprise to me. I had expected an extension of the Maine coast and woodlands. Instead we found rolling hills, small well-to-do farms, and tree lined ravines. This was my first painting and I think you can get a sense of the land from it. Even though it is a relatively small island there are several rivers of which this is one. The nuances of color don't come across in this photo. In the painting the colors are more intense with subtle differences such as a red hue across the water and in the clouds which barely show up here. I think the color comes somehow from the red sandstone that makes up the island. I wish I had taken the time on this trip to draw more people. Just a few lines and a bit of tone can suggest so much. These two were sitting on a stone wall overlooking a spillway. 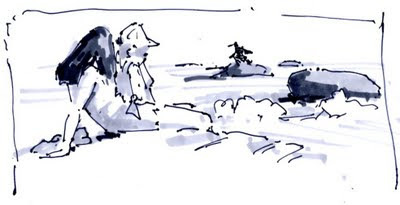 The cormorants sitting on the rock were waiting for a meal to show up. There is a visual triangle formed between her dark hair, the dark of the birds and the shadow accent of the rock that moves the eye around the work. Simple, quick and all it takes to put me back in that moment. Greetings from Prince Edward Island! Boston to Camden, Maine to PEI....what a great trip. I brought acryics this time because the person I was painting with is allergic to solvents. 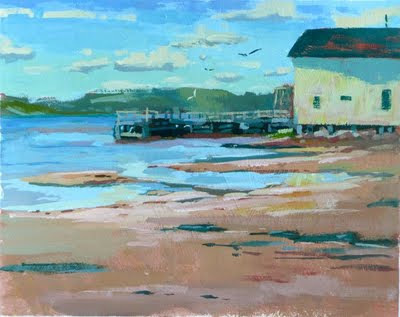 Plein air acrylics present their own problems but the fast drying time is always a pleasure when packing for traveling. 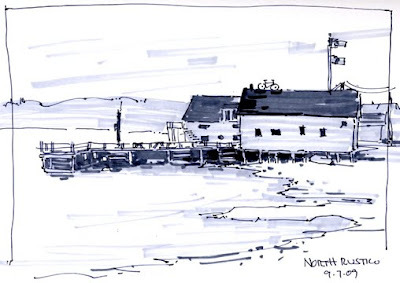 This is a quick morning study of a boat that tends the mussel lines that hang in the harbor. I was trying to subdue and abstract the background so the focus was clearly on the boat. This would have been easier with oil and I may try to repaint this both larger and in oil later this month. I'll post more when I get back on Thursday.